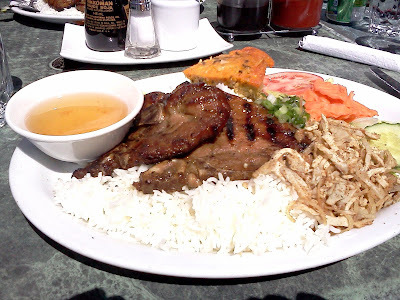 This is probably my favorite Vietnamese restaurant in Montreal. I usually order the grilled pork on rice and it's a tasty meal. I've been there several times by now, and I enjoy it each time. I once ordered the large triple meat platter (I forgot the exact name) but that was also good. Their Vietnamese three color bean drink is also my favorite out of the places I have tried it. It's probably one of the more "costly" Vietnamese restaurants, but it's worth the price (and still not an expensive place to eat). I'll post pictures the next time I go there. Photo added from yesterday's visit. It's #41, BBQ pork, sliced pork bits and some kind of egg omelette.